One of the most insidious remnants of war-torn terrain can be left over landmines. Nearly undetectable and almost always forgotten landmines can cripple and kill innocents well after a conflict has been settled. To help remedy this problem Colombian design firm Lemur Studio has developed a landmine detector concept that’s easy to use and extremely portable. 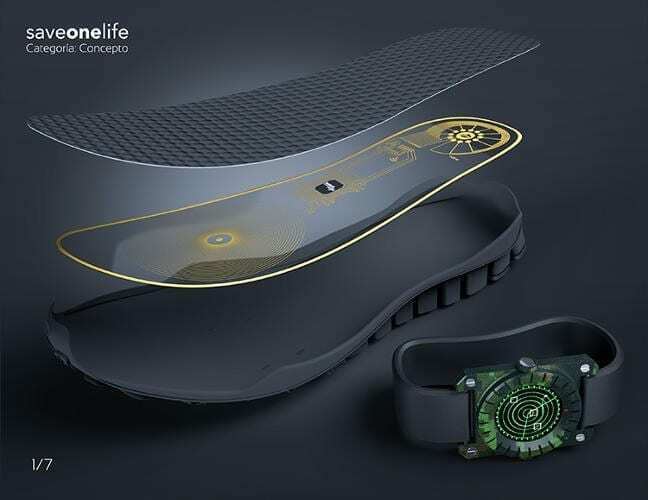 SaveOneLife is a miniature mine detector that fits inside the sole of a shoe. Built using a conductive metal coil that radiates an electromagnetic frequency the device can spot large piece of metal that are nearby, including landmines. “The device was created with the goal of saving a life, hence the name, first by the families of the victims and second for the cost effects of military forces by the loss of his men in combat,” says Iván Pérez, Lemur’s creative director. To notify wearers if they’re about to stumble into an area where a landmine might be hidden the SaveOneLife system also comes with a watch-like interface that alerts a wearer to the position of any nearby trouble with an easy to read locator map. April 16, 2019 - The World's First Retirement Home for Bomb-Sniffing Dogs OZYA shelter in Phnom Penh is giving veteran dogs, who would otherwise be euthanized, a good home. March 23, 2019 - Nonprofit suggests using pouched rats to detect landmines in DMZ The HankyorehRats have already been used to clear landmines in nine countries. April 5, 2019 - Eriez metalarm metal detector sold to MMD Mineral Sizing Global Mining ReviewEriez metalarm metal detector has been sold to MMD Mineral Sizing (Europe) Ltd. for The HALO Trust's landmine removal efforts in Africa.